1959 Cadillac Getting A/C Up And Running Aagin. My stepdads 1959 Cadillac has the complete orginal air conditoing system in tact. It last worked about 6 years ago. It was properly evacuated, and recharged 6 years ago (with r12) and everything did function properly and it blew cool air. Since then, it has all leaked out. (Sourced the leak down to a faulty shrader valve core.) So the system has no pressure in it now. I have access to a vacuum pump and all of the propper tools. I was just wondering, what would be the next step. Im getting a new drier of course, and the system will be vacuumed down before it is recharged. But I didn't know if i should flush down the system first? Or replace the expansion valve while i'm replacing the drier. Since it was operational a few years ago, and the system has not been left open up. Can I just get away with changing the drier and then vacuum down the system? Any help would be appreciated. Were defiantly sticking with r12. I'd change the drier, I'd change the bad shraeder, I'd get get good-quality sealing caps (they are important to keep the refrigerant in), pull a great vacuum and get 'er done !!! Thank you for responding so quickly. Thats kinda the plan I had in mind too. I have a question about those shrader valves though. I googled, "1959 Cadillac shrader valves" and got no results. So I have to source new sharder valves for the system but I cant find them. Where sharder valves different from system to system? Or are all r12 shrader valves the same? Your Caddy uses standard R12 schrader valves - use a 1970 model year GM part if you need a place to start. 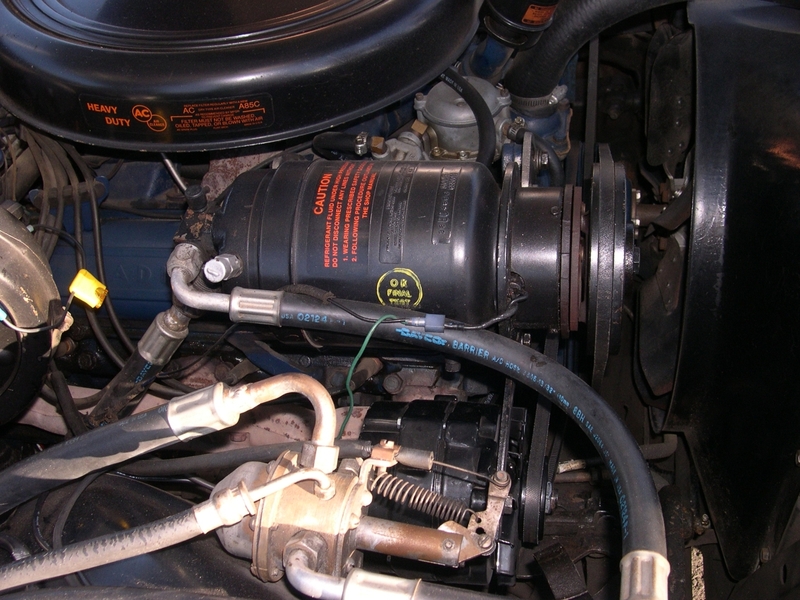 The 1959 GM system is a hot gas bypass. There is no POA valve, and the bypass valve is tied in to the temperature control. There is a cable adjustment that is part of the system, and the valve itself can be rebuilt. Always static pressure test R-12 systems with some other gas before charging with R-12. Everyone thinks that their only leak is at a shrader valve (since they all leak a little, but the overcap should stop it from escaping). Old systems use shrader valves that are the same dimensions as tire valves, but do not use tire valves because they have a different kind of rubber in the seat. Always static pressure test R-12 systems with some other gas before charging with R-12. Can I do that with filtered compressed air? And if so, how? Fill with test gas to 100-150 psi, close manifold valves but leave manifold connected to the car, wait several hours to see if there is any pressure loss. Do not run the compressor. If you use air it needs to be really dry. Air straight from a compressor often contains droplets of water. You can use argon, nitrogen, or the various MIG or TIG mixed inert welding gases if you have that in the shop. (Do not use oxygen!) Any cylinder gas needs to have a regulator on the cylinder to keep the pressure below 150 psi, which is the typical design burst pressure of the evaporator and other parts of the low side.